In the Start menu search box, enter “task scheduler” or “schedule tasks”, whichever works, and press enter. 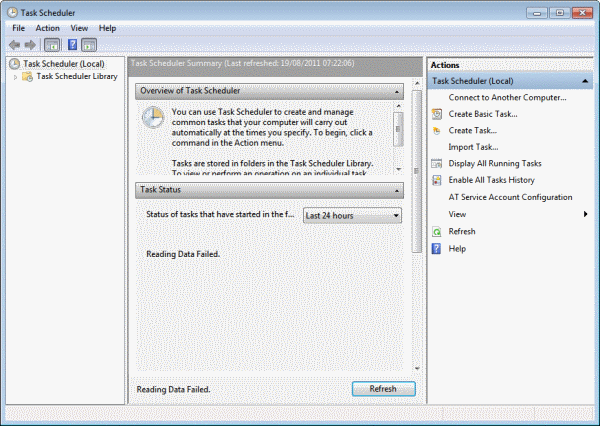 This opens the task scheduler dialog box. 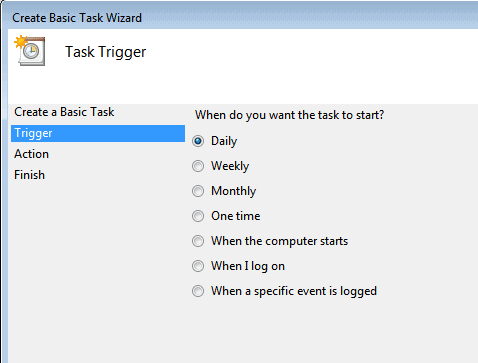 Click on Action and in the dropdown menu, choose Create Basic Task. 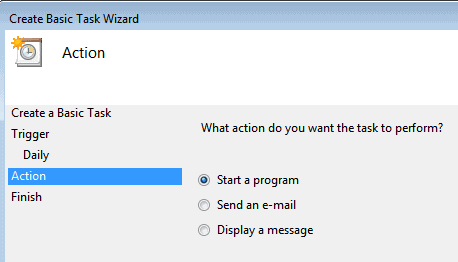 This opens the Create Basic Task Wizard. Give the task a memorable name and a description, keep it direct and simple and easy to recall. At this point, if you have not done so already, decide how often you want the Disk Cleanup utility to run. You can choose Daily, Monthly, or one time. For the following example, daily is selected because the PC being used in this example runs a heavy load of internet traffic and overall use. If the PC is being used for home business purposes, it might be wise to schedule daily Disk Cleanup in order to ensure that data is not stolen by rogue malware. Also, set a system restore point before applying these changes. Press Next. Choose the start date. This is usually going to be “today” but you can set it to begin at a later date. Choose the start time. Keep in mind that you do not want this utility running while you are going to be using the computer for something that cannot be interrupted. Schedule it when you know there will be a break when the PC will not be in use. Select Action and click “Start a program” then click Next. 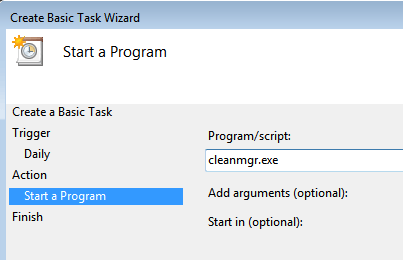 Type cleanmgr.exe in the Program/script box, and /d driveletter in the add arguments box and click Next. Replace driveletter with the letter of the drive that you want to run the disk cleanup on. Any time interval can be selected, customized to the needs of the user. Windows 7 offers some versatile tools for customization and this is definitely one to take advantage of. 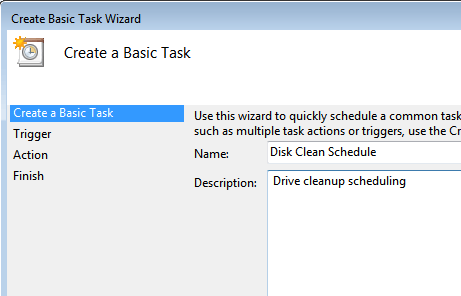 Set the time for the scheduled Disk Cleanup for a time that you know the computer will be on an awake. The utility will not run when the PC is off. Overall, since it is necessary to use the Disk Cleanup utility regularly, this gives the user the option to set it and forget about it. This is one for the geek in all of us. Isn’t Ccleaner doing all of that and a little more? If you rely on another browser and never use Internet Explorer, how can DiskCleaner possibly be cleaning up ” temporary internet files containing sensitive data such as passwords and credit card numbers”? Disk Cleanup is only taking care of “native” Windows files, e.g. Internet Explorer cache, which means you cannot use it to delete other browser caches unless you use the same cache location. Also lets not forget about defragging regularly as well.